Why Valley Spuds Fresh Processed Potatoes? Everyone loves potatoes, but no one likes to peel or cut them. 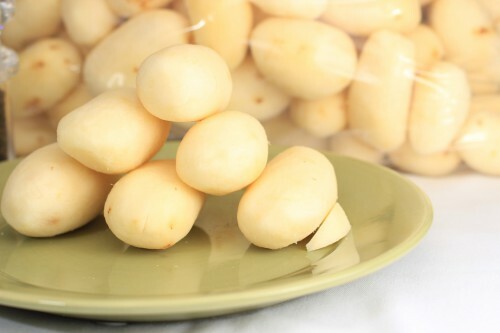 Potatoes are a staple crop around the world and Valley Spuds provides a semi-finished fresh potato product that is cleaned, cut and cooked to your specifications. Then you take the potatoes and makes them your own. There are many advantages to using a processed potato product compared to house-made potato items. Zero Waste– The first advantage is that there is zero waste in our products. According to the standard book of yields an average potato yields about 80%, so that puts 20% of the product directly in the trash, either through the peeling process or having to cut out pieces that aren’t usable. Consistency– Second, with our product you can be sure of the consistency and quality with every batch, guaranteeing that the potatoes will be cut the same size and all of them will be completely cooked to your specifications. We create a Gold Standard that cannot be matched by through typical labor. Sanitation and Saftey– Third, you can cut out the possible injuries that come from potato processing and cross contamination. Either cutting your fingers peeling the potatoes, avoiding having to deal with large pots of boiling water to cook them, slicing off parts of your hand using a mandolin to julienne sweet potatoes, or loss of appendages because of issues that arise when the starch starts building up on your knife making the potato to stick to it. I actually saw a guy lose the tip of his finger due to potato frustration. Lower Cost– Last and most important, our product can save you countless man hours from all of the labor intensive work that comes from processing potatoes. Valley Spuds cleans, peels, cooks and cuts the potato for you, and depending on the dish and what product you are using, that can be anywhere from 30%-75% of the potato cooking process. You can save over two and a half hours on the time that it takes to make mashed potatoes and over four hours on the time that it takes to make potato cuts. The rationale to use a fresh processed potato over a frozen potato is easy to explain. When you freeze a potato, the taste and texture of the product is instantly destroyed. Once frozen the starches in the potato start to turn into sugar, changing the taste and causing them to darken when cooked. Also, when you freeze a cooked potato product the water in the potato separates from the starch causing the product to be watery once it reaches the customer. Here at Valley Spuds, we have been processing potatoes since the 1960’s. Starting in Santa Monica, we moved to Oxnard, California which is a little less than 70 miles North of Los Angeles. Our products have that real potato taste that other companies lose by over-processing their product. We have an extensive and ever increasing product line that has many items that can be used for a variety of culinary purposes. All of our potatoes are third party audited and we are HAACP certified to ensure that you can rely on us to give you a safe and superior product. If you have any questions about our product line or would like to discuss how Valley Spuds can help enhance the dining experience of your customers by providing a high quality, time conserving and cost effective fresh potato product. Please contact Monique Ariaz at Monique@ValleySpuds.com. Whatever you potato preparation needs are, Valley Spuds drastically cuts down your prep time. That’s because we do all the work for you ahead of time and all you have to do is grab the bags we’ve delivered to you and begin cooking. The secret to an efficient and fast restaurant is using prepared potatoes that have been quality inspected, chosen for you and already prepared. Get your plates to the table faster and make your customers happier with Valley Spuds! When your restaurant or catering company looks at your man hours for preparing the potatoes, you’ll be surprised at how much time is spent every day. Using Valley Spuds‘ prepared potatoes instead cuts all those hours out of your labor costs. You may think it’s too expensive to use prepared potatoes, but when you compare the costs, you’ll find the savings are substantial. This is partly due to our processing plant efficiency and automation. We have made heavy investments over the years in equipment and processes that allow us to keep our costs down. This way you get fully prepared potatoes ready to cook for only a little more money.